Description: This woody vine is 10-60' long, producing stems that branch occasionally. It has the capacity to climb fences, trees, and other vegetation. The stem base of the vine can be up to 4" across; it is covered with rough-textured bark. Smaller stems are reddish brown to tan, more smooth, and sometimes glaucous; they have scattered white lenticels (air pores). Young vegetative shoots are light green and glabrous. Alternate deciduous leaves occur along the stems and shoots; they are 2-5" long and 1¼-3½" across. The leaves are obovate to oval-orbicular in shape with finely crenate margins; they have wedge-shaped to rounded bases and short obtuse tips. The upper leaf surface is medium green and glabrous, while the lower surface is pale green and glabrous. The slender petioles are light green and up to 1" long. Clusters of flowering cymes are produced from short spur shoots and leaf axils; to a lesser extent, they are also produced from the tips of stems. Each small cyme has 1-3 yellowish green flowers; individual flowers span about 1/3" (8 mm.) across. Oriental Bittersweet is almost always dioecious, producing male (staminate) and female (pistillate) flowers on separate vines. Regardless of gender, each flower has 5 spreading petals that are lanceolate and a short calyx with 5 shallow lobes. Male flowers have 5 stamens, while female flowers have pistils with 3 knobby stigmata. The slender branches of the cymes are light green and glabrous. The blooming period occurs during late spring to early summer for about 2-3 weeks. Fertile female flowers are replaced by green fruits during the summer. Individual fruits are about 1/3" (8 mm.) across, globoid-ovoid in shape, and glabrous. At maturity, the outer husk of each fruit turns yellow and splits open into 3 parts to reveal a bright red aril with a fleshy texture that contains 1-2 seeds. Individual seeds are 4-5 mm. long, ellipsoid in shape, and somewhat flattened. When this vine grows along riverbanks, some of the fruits and their seeds may be distributed by water. The root system has spreading lateral roots up to ¾" thick. 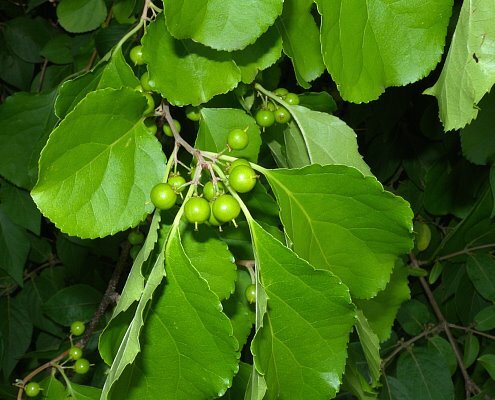 Cultivation: Oriental Bittersweet prefers partial to full sun, mesic conditions, and soil containing loam and/or silt. While its growth will be slowed, this vine also tolerates considerable shade. In North America, it has relatively few problems with pests and disease organisms. However, this vine should not be planted, because it is aggressive and potentially invasive of natural habitats. Range & Habitat: The non-native Oriental Bittersweet has naturalized in NE Illinois and scattered counties elsewhere (see Distribution Map). While it is still relatively uncommon within the state, this vine will undoubtedly continue to spread and become more common in the future. It was originally introduced into the United States as an ornamental plant. Habitats consist of disturbed open woodlands, woodland openings, woodland borders (especially along roadsides), thickets, fence rows, overgrown vacant lots, and abandoned fields. Disturbed areas are preferred, although some natural areas may be vulnerable to the invasive tendencies of this vine. 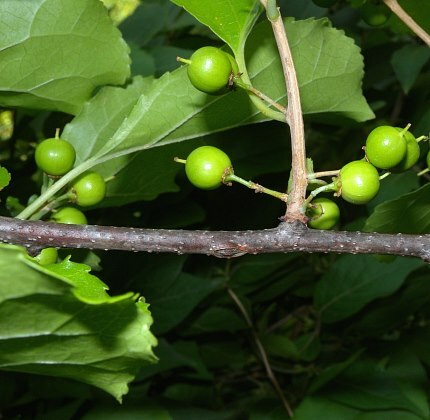 Faunal Associations: It is still unclear to what extent the insect pests of the native American Bitterweet (Celastrus scandens) and related species will feed on Oriental Bittersweet. At least one insect that is found in North America, Unaspis euonymi (Euonymus Scale), is known to feed on this introduced vine. The nectar and pollen of the flowers attract mostly bees, including Halictid and Andrenid bees. The fruits are consumed by various birds; these species include the Ruffed Grouse, Ring-Necked Pheasant, Bobwhite, Wild Turkey, Eastern Bluebird, Robin, Cedar Waxwing, Cardinal, Northern Mockingbird, Starling, and Northern Flicker. They are also probably consumed by the Fox Squirrel and other small mammals. These animals help to spread the seeds to new locations. Humans also play a role in the spread of this vine when they use it as an ornamental plant in landscaping, or collect branches of the colorful fruits for ornamental purposes. Some birds undoubtedly construct nests within the dense leafy cover that this vine provides. Photographic Location: A fence row along a vacant lot in Urbana, Illinois. 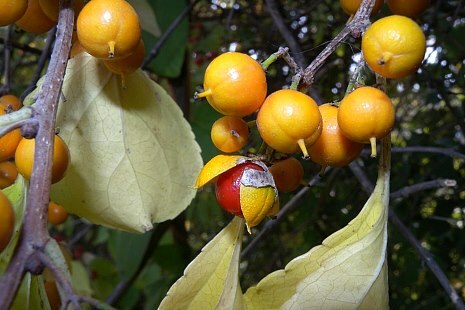 Comments: This introduced vine has ornamental fruits that resemble those of the native American Bittersweet (Celastrus scandens). Oriental Bittersweet can be distinguished from American Bittersweet by considering the following characteristics: 1) the husks of its fruits are yellow, rather than orange, 2) its leaves are more orbicular in shape with more obtuse tips, especially where the flowers and fruits are produced, and 3) its cymes are usually produced from axillary shoots or leaf axils, rather than terminally at the tips of branches. In areas where both of these woody vines occur, it is possible for hybrids to develop that have mixed characteristics. However, the pollen of such hybridization reportedly has low viability (Dreyer et al., 1987).